Lucinda’s school had an Open House last night, and we got to go in and see all the stuff the kids have been doing all year. 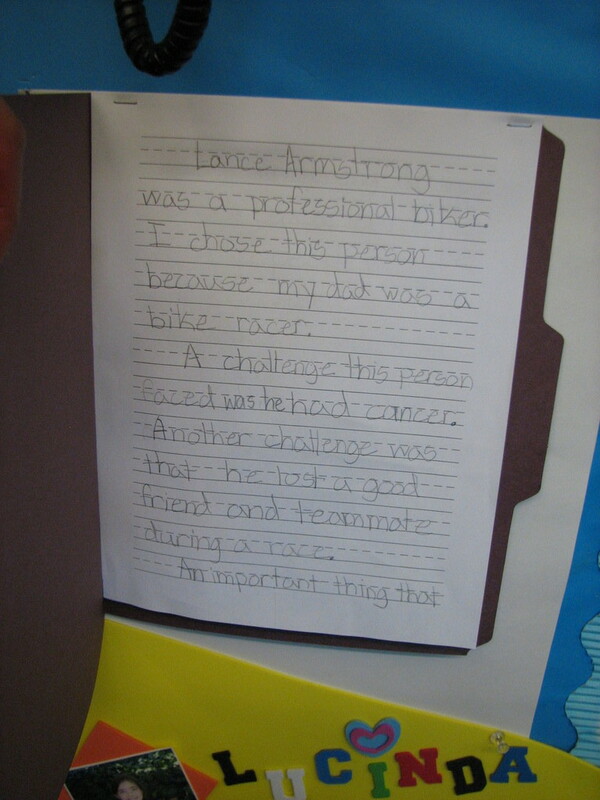 Apparently, one of the assignments they did was to write a short report on a famous person. They must have done this entirely in class, because I don’t remember her doing any of it at home. I thought that this was very sweet. So what if all that was 30 years ago. 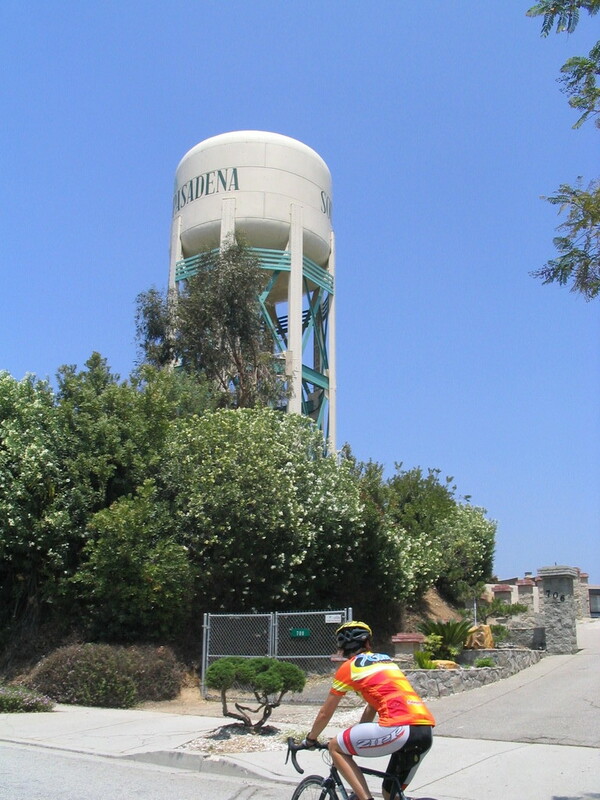 Today’s noontime bike ride was the Water Tower route. Nothing especially remarkable happened along the way, but it was a perfect day for riding, and we had a very nice time. 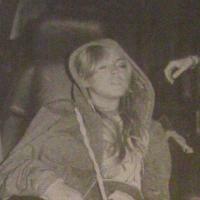 Today’s Los Angeles Times has a couple of articles about the continuing train wreck that is Lindsay Lohan. One is on the front page, and talks about how underage movie stars go drinking at trendy nightclubs in Hollywood. Following the article inside to page A-16, we see the paparazzi photo of Ms. Lohan passed out in her car with her AA sobriety necklace hanging from the rear-view mirror. 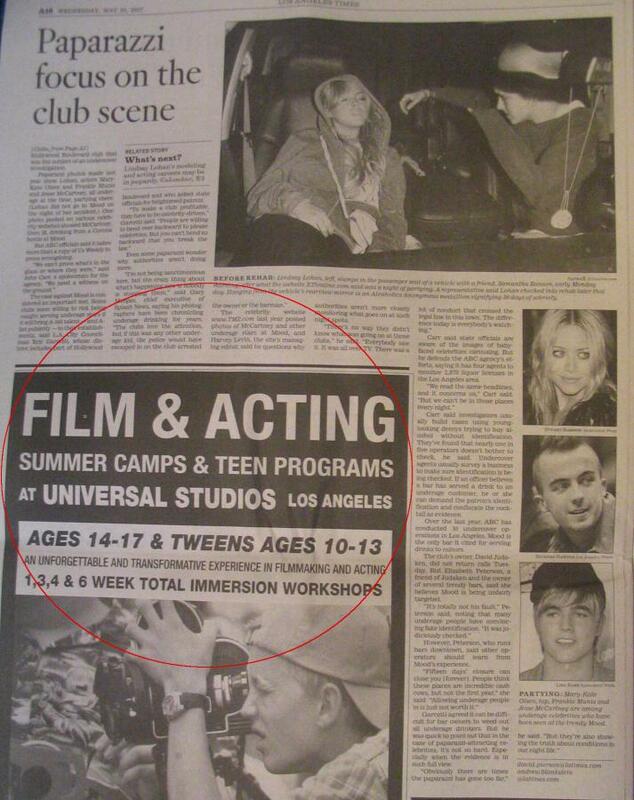 And right below the article, a large ad for a summer acting camp for teens. You know, so they can learn to act and be movie stars, just like Lindsay Lohan. Talk about great product placement. Click the picture to see the whole page. Today Lucinda and I did the hike up Echo Mountain. This is close to our house, and it was a nice day for it. The actual hike is about 2.5 miles each way, and the climb is about 1,400 feet. We started at the trailhead at the top of Lake Avenue, and we headed up the trail. 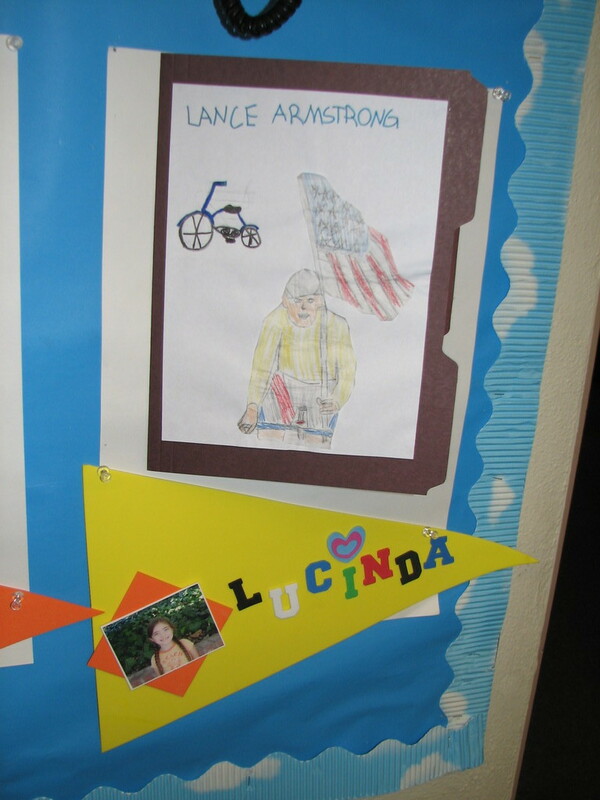 Lucinda did very well. She maintained a good, steady pace most of the way. She didn’t even complain, aside from wanting to take a few breaks when we came to spots of shade. After we passed the 2-mile marker and I told her we were almost at the top she started running. This was the first time that she has done an entire hike like this unaided. Last summer when we climbed Mt. Lassen, she did about half the hike riding the mule. Along the way, we saw some interesting nature sights. There were lots of lizards along the trail, and a hawk soaring overhead. And there were some nice cactus flowers near the start of the trail. At the top, Lucinda had fun poking around the ruins of the former White City. She was going to try out the Echo Phone, but she got self-conscious about yelling into it. We sat down and had some snacks amid the ruins. And she particularly enjoyed looking through the rubble of the old powerhouse. Finally, we headed back down, covered with dust. Overall, it was a fun day. Today’s ride was a new route that Gene called “No Tuna For Me”. It went up to Sunland, but then came back by a different route, completely avoiding La Tuna Canyon. I was a little skeptical about this, since I like La Tuna Canyon, but this turned out to be a pretty nice route. We started out straight west, across Pasadena and Eagle Rock to Glendale. Then we took Kenneth across Glendale, which was nice. It has a lot less traffic than Glenoaks. When that ended, we got on Glenoaks and rode up into Sunland. 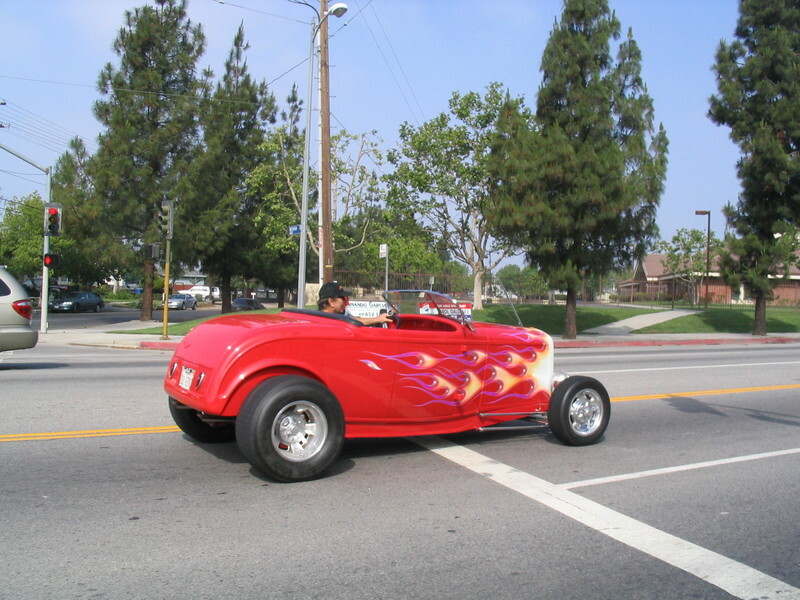 That’s where we saw the hot rod roadster. In Sunland, we took a right on Peoria and rode along the edge of the big landfill there. Fortunately, the wind was blowing the right way so we didn’t have to smell it. Then we took several small streets up through the hills. The area there has a very rural feel. 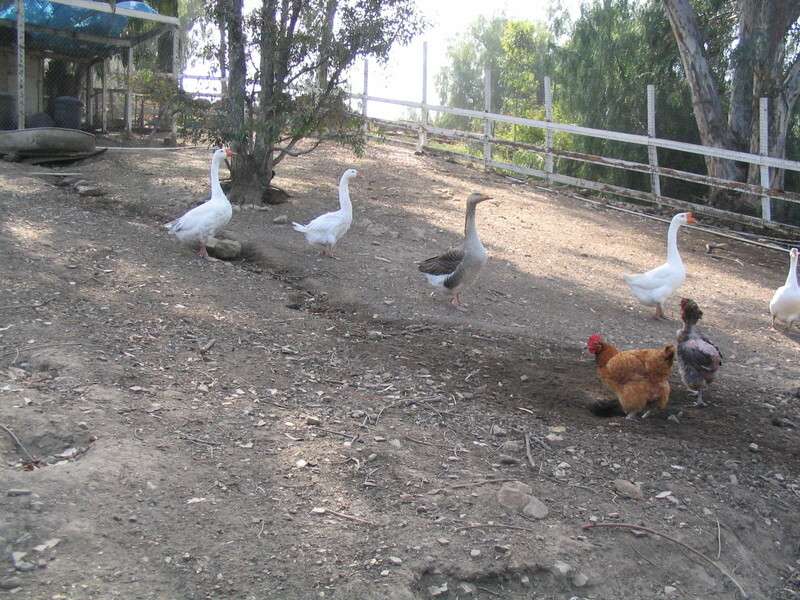 Most of the houses had horses, and one had geese in the yard. Finally, we came out on Sunland Blvd by the 210 freeway. Crossing the freeway, we turned off Sunland and took some small streets through Tujunga. 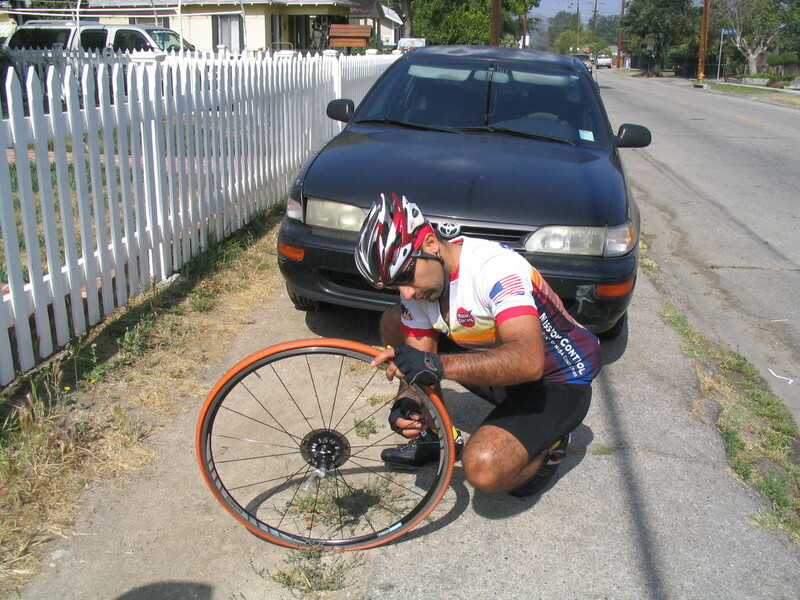 That’s where Gaurav got a flat. We stopped to fix it, and while we were fixing it, a guy from across the street came out of his house carrying a floor pump. He said that he’s had to fix flats on the side of the road many times before, so he thought the pump could help us. And he was right. It was a very nice thing and helped us a lot. 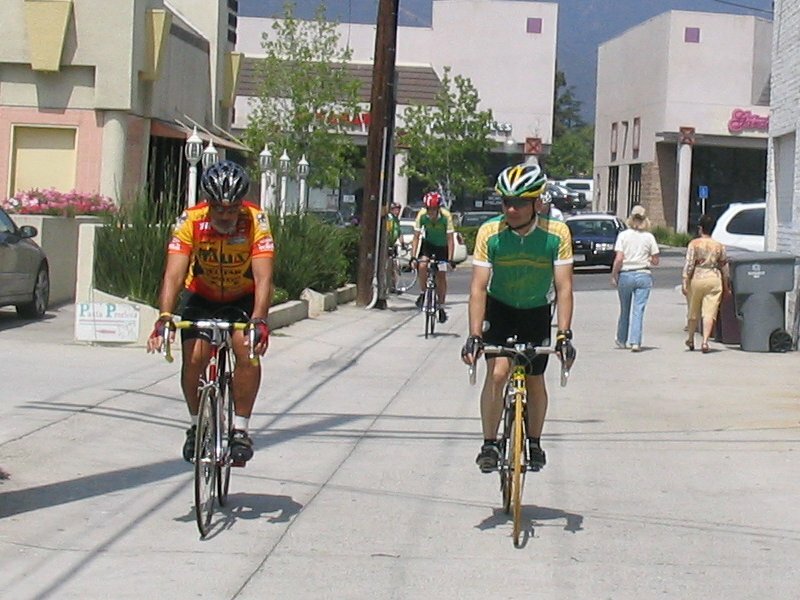 We came out on Foothill Blvd, which we took for a short distance through the middle of Tujunga, and then we turned down Tujunga Canyon Road and from there it was all downhill into Montrose and our snack stop at Oven Fresh Bakery. We saw the Pasadena Triathlon Club across the street while we were there. They were in the middle of a long ride of their own. After the snack stop, we headed back through La Cañada into Pasadena. Then we went down Arroyo and Lincoln to get back to Orange Grove, which brought us back to the park. At that point, I had 44 miles, so I rode out to Sierra Madre with Newton before turning around and heading home with my Magic 50 Miles for the day. Today we went down to the OC so Lucinda could visit with Grandma and Grandpa. While she was doing that, Cathy and I went out. 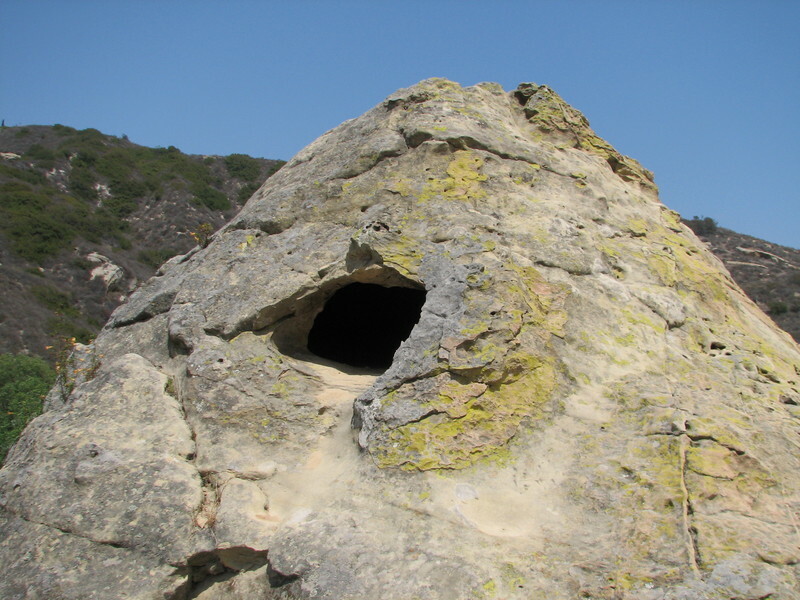 We went to Aliso and Woods Canyon Wilderness Park and did an easy hike there. I’d found it on the net yesterday, and the wind caves sounded interesting. The actual trail was very easy walking. There were lots of people riding bikes there, also. It’s probably a better trail for bikes than for walking, just because a bike can cover the distance much faster. 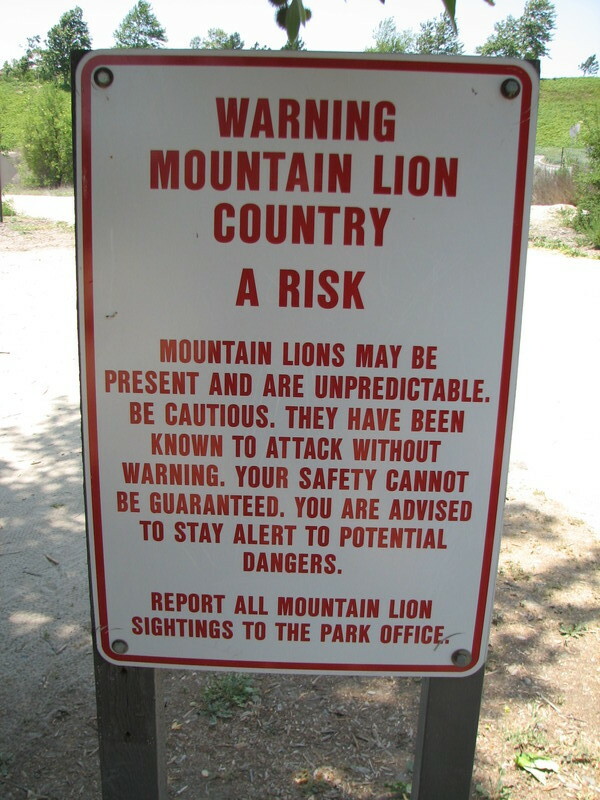 Signs warned of mountain lions, but we didn’t see any evidence of them, aside from some large scats along the trail. We saw a flowering cactus along the trail, as well as lots of colorful birds. There was a very large birdhouse a short distance away from the trail. The sign said it was a raptor perch for hawks. We saw some hawks flying around, but we didn’t see them landing on the perch. 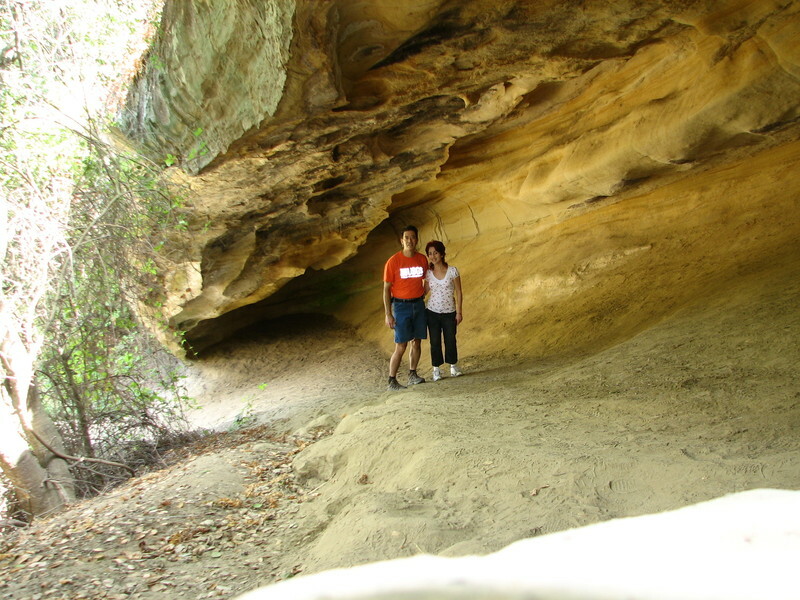 Cave Rock was a large outcrop of sandstone with some small caves in it. They were large enough to crawl inside, but not high enough to sit up in. 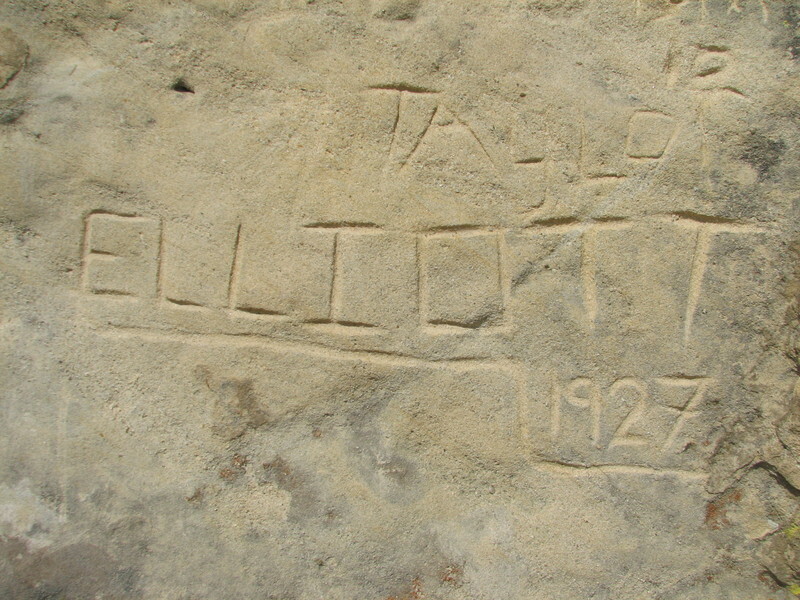 The sandstone is quite soft, and people just can’t seem to resist carving their names in it. We saw one name dated 1927 on the side. 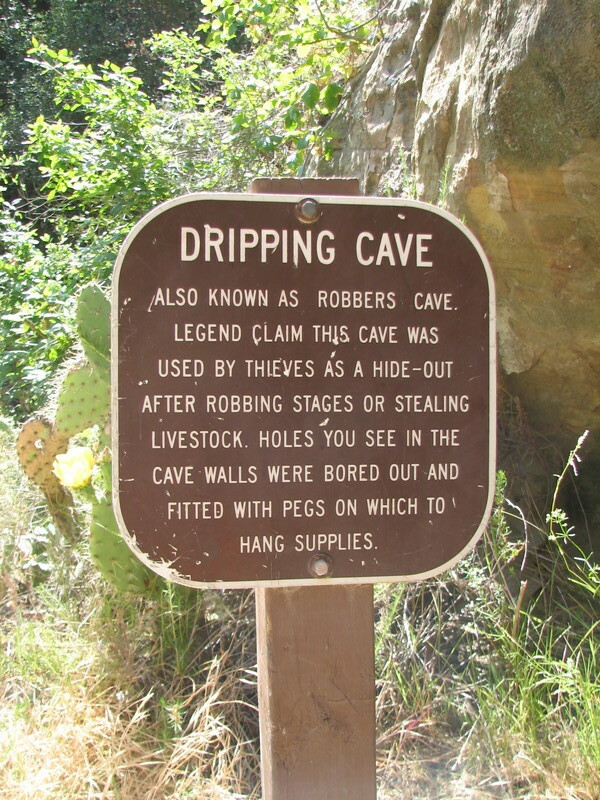 The highlight was Dripping Cave, which is reputed to have been a hideout for stagecoach robbers in the old days. The ceiling still had black soot on it from campfires. On the way back, we came across a rattlesnake snoozing on the trail. It was about 3 1/2 feet (1m) long. It woke up and looked at us, and then slowly slithered away into the brush. Overall, it was a pretty nice little hike. Today’s lunchtime ride was the flat one out to Arcadia and back. I went with Eric and Vikki, and it was a perfect day for riding. There’s not much to be said about this ride. It was pleasant, but we didn’t see anything particularly amusing this time, aside from the guy with one leg who rode past us going the other way. 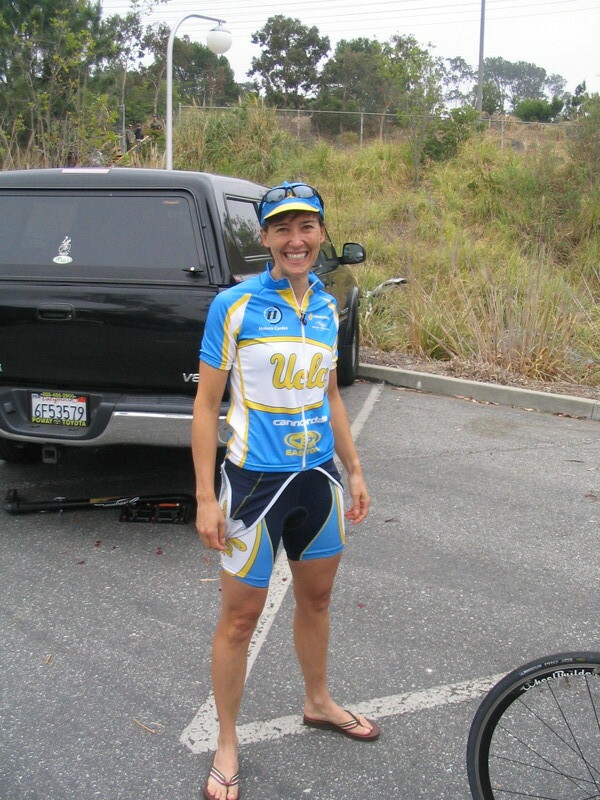 It looked extremely odd, since he didn’t have a prosthetic, and he was just pedaling with one leg. He was going pretty fast, too. But I’d guess he probably still has some trouble going up hills. This is the story of my pump. It was my prize for 4th place in a race on May 22, 1977. It’s not the best pump, but it’s still special, since it reminds me of a very good day. 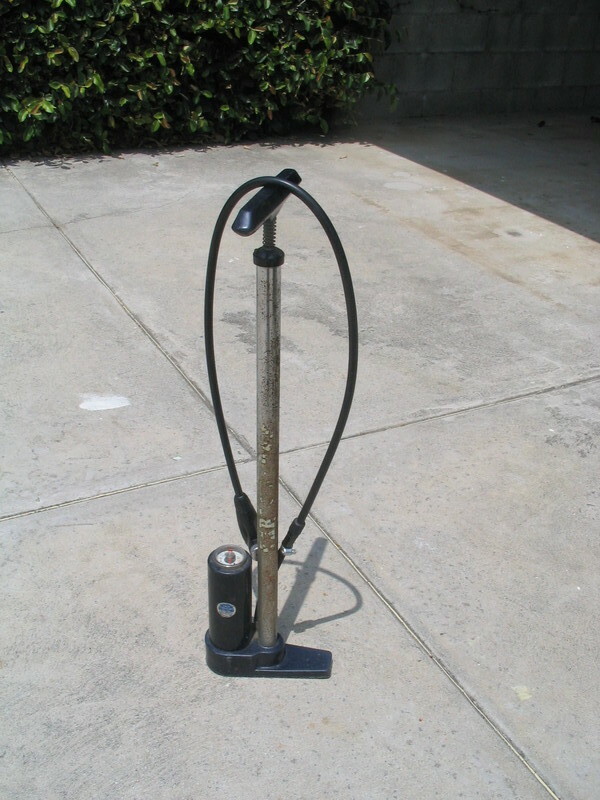 And for 30 years I’ve been using it to pump up my tires before every ride. The race was the Maryland Road Classic in Baltimore. 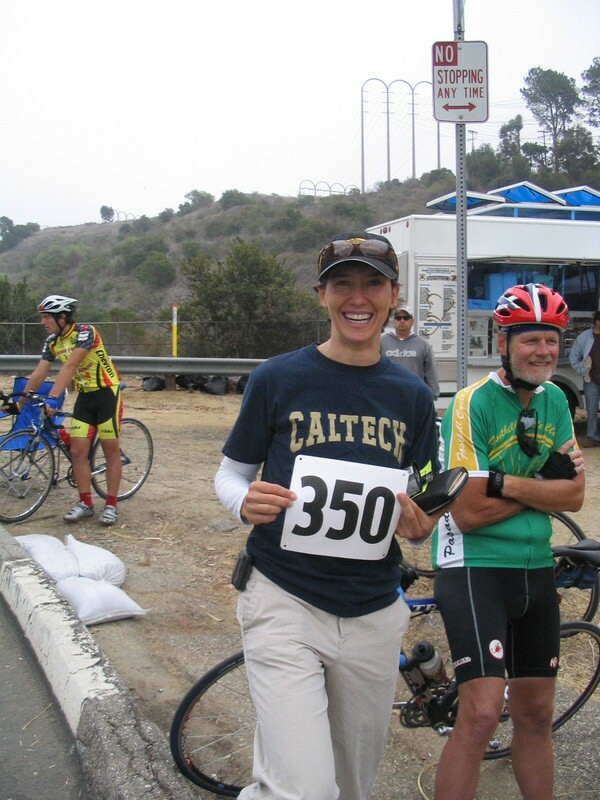 I was racing as a Junior. 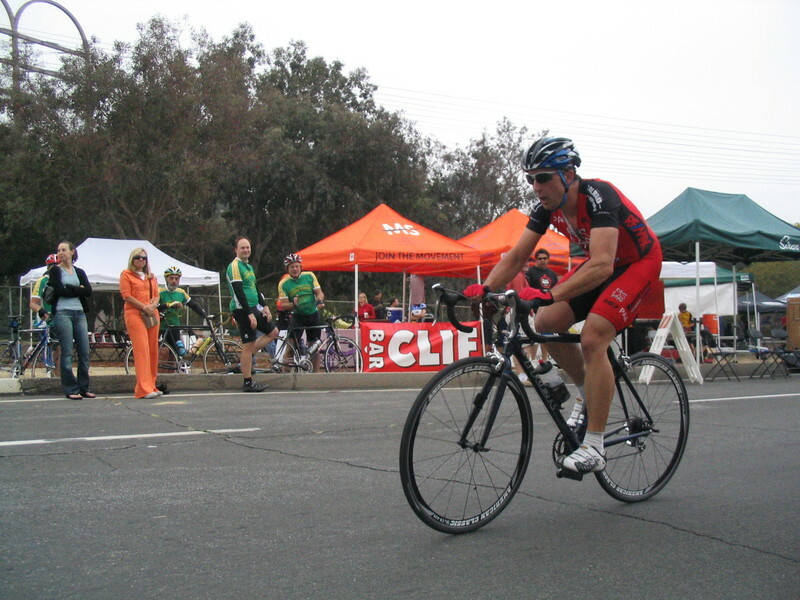 The race was a criterium around a school. It was mostly flat, but with one small hill. The distance was about 15 miles. This was one of those races where the pack was, for lack of a better word, lazy. They never really got going very fast. Nobody wanted to push the pace. I rode with the pack, just staying in the group. I wanted to break away, but it seemed that every time I tried, nobody wanted to come along, so I just dropped back into the pack. Somewhere along the way, three guys managed to get away, and I missed it. So when it came down to about three laps to go, I was still in the pack. At this point, I decided to just go for it. I took off by myself, hoping that someone would come along. Nobody did, but I figured I’d just try to solo to the finish. This didn’t seem like an especially good idea, but I thought that my chances of making it solo to the finish were better than my chances in a pack sprint at the end. So I just put my head down and went for broke. As it turned out, I gained enough time on the pack that I was able to solo across the finish line for 4th place. This was a Good Thing, since it meant I was one step closer to my goal of upgrading to Category 2. 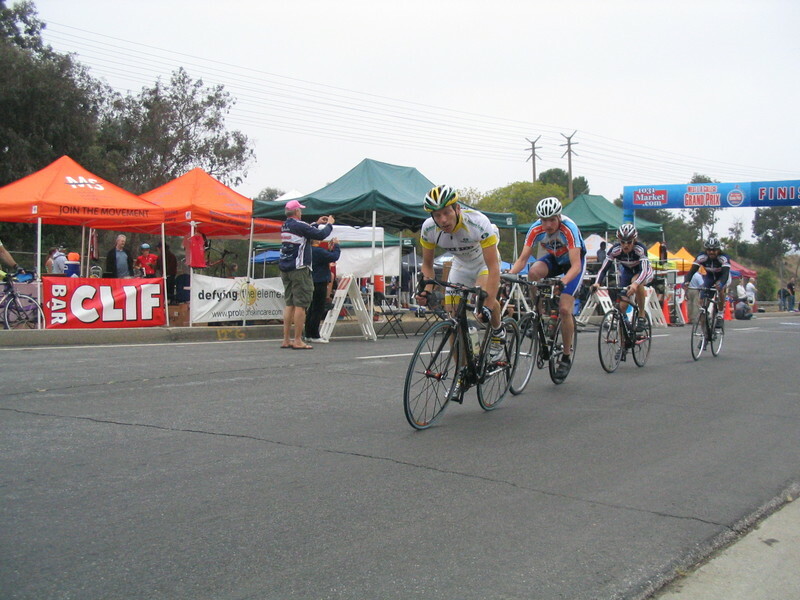 In those days, for a Junior to get Category 2 required three top-three finishes or six top-six finishes, so 4th place counted. I already had one 1st place finish, so I was on my way. My prize for this was this pump. And I still have and use it to this day, 30 years later. 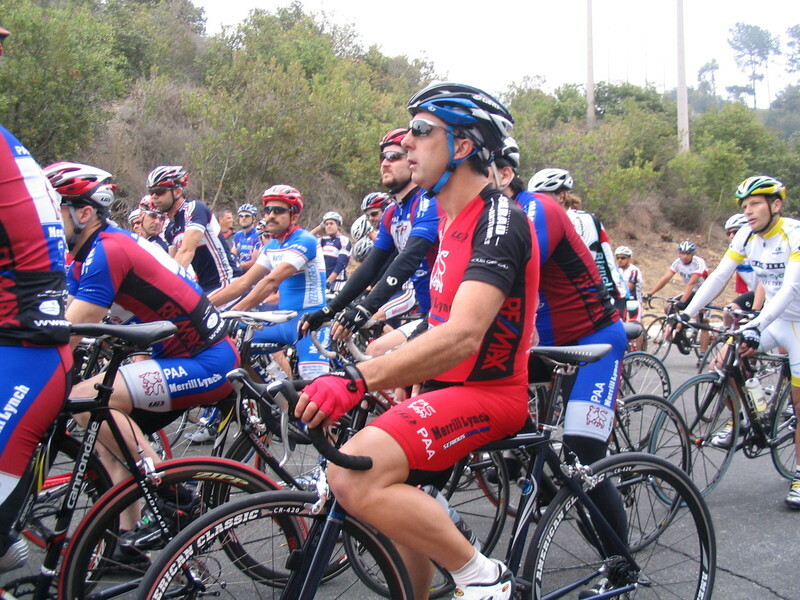 Today’s ride was out to Culver City to see the West L.A. Grand Prix bicycle race. Philippe, who usually rides with us, was going to be racing. We headed downtown by way of Huntington Drive and Mission Road. Along the way, Ben got a flat. Because we were on a strict timetable, we had to work fast. Like a NASCAR pit crew. Steve held the bike, Ben took off the tire, Gene got the new tube ready, and I took pictures. We got that flat fixed in just a few minutes and we were on our way again. Then we rode straight through downtown L.A. on Main St all the way down to Adams Ave.
After a right turn on Adams, we were heading west. Back in the late ’80s, we used to read about how the West Adams neighborhood was an up-and-coming hip area for people to buy and renovate the decrepit old mansions there. We didn’t see any evidence of this today, but we weren’t really looking around. 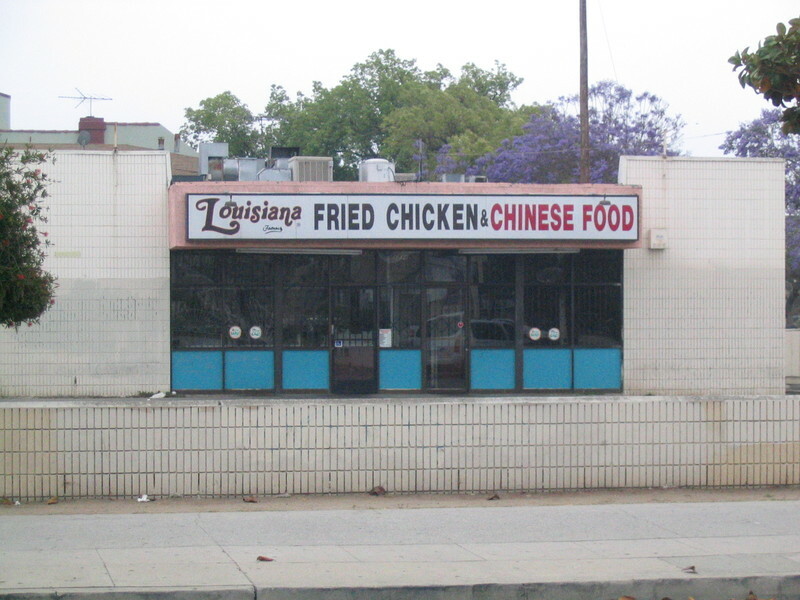 The only picture I took there was the “Louisiana Fried Chicken and Chinese Food” place. That was an odd combination. We took a left on Vineyard Ave, which took us to Farmdale, which is one of the few non-major streets that cross the old railroad tracks there. 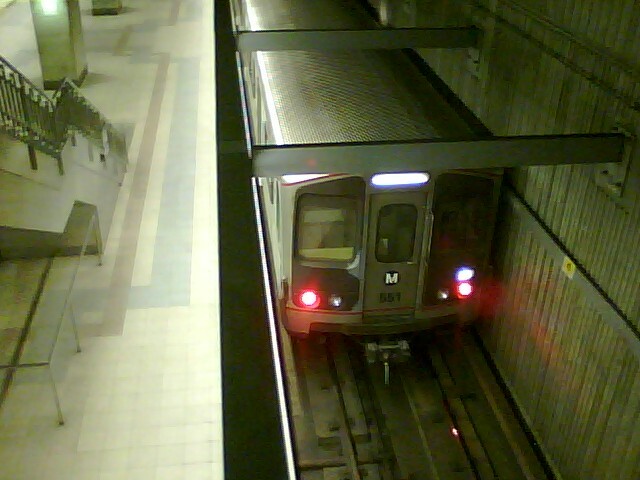 Those tracks had obviously not been used in a long time, but they are planned as the route of the new Metro Expo Line. Then we took a right on Rodeo Road, which later merged into Jefferson for the last few miles into Culver City. When we got to the race, the Category 5 men were lined up and ready to go. I saw Philippe in the “A” group. 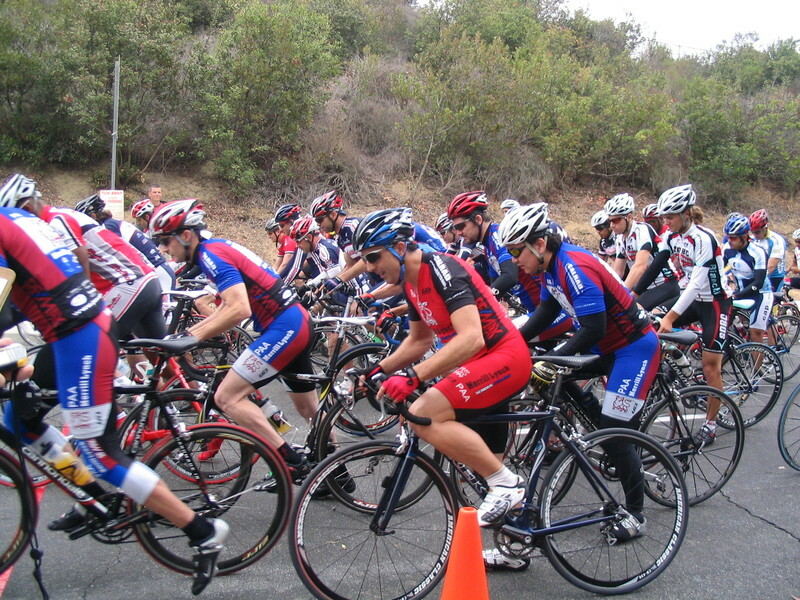 Apparently, there is a rule that they are not allowed to have more than 50 Category 5 riders in a single group. This race got so many entries that they split it into two groups, which started a half-lap apart. I went up to the stand to see about donating a prime for them, but they said that there was a rule that Category 5 races could not have any sort of prizes. So that was out. And the other races were completely full of primes. So oh well. I saved my $20 to fight another day. The race was pretty good. A breakaway formed pretty early on. Then the two strongest riders dropped the rest of the breakaway. Philippe finished the race, but he was one of the last finishers. Still, it was a good effort for a first-time racer. We saw Vikki there, but we couldn’t stay for her race. When we were leaving, she was just getting on her trainer to start warming up. The ride back went up Venice Blvd. 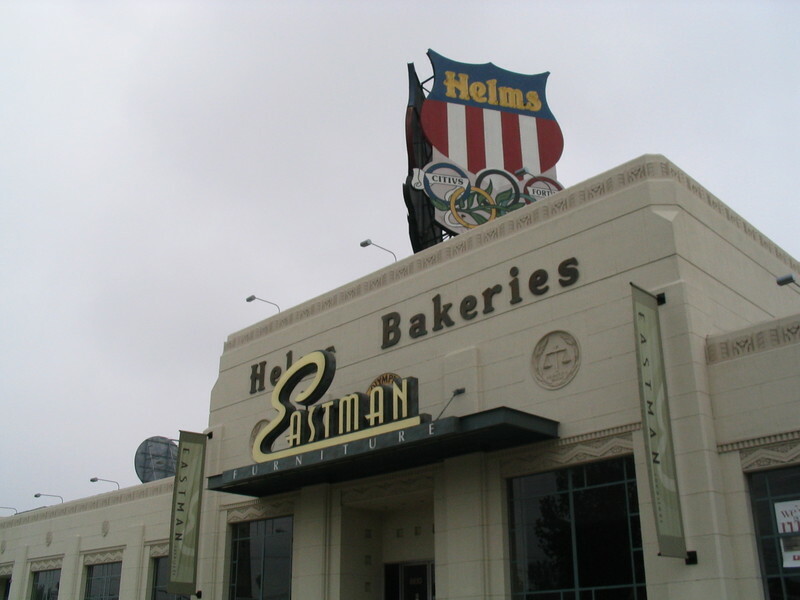 Along the way, we passed the old Helms Bakery, which was a big piece of L.A. history. The building sat empty for many years before it was turned into stores some years ago. 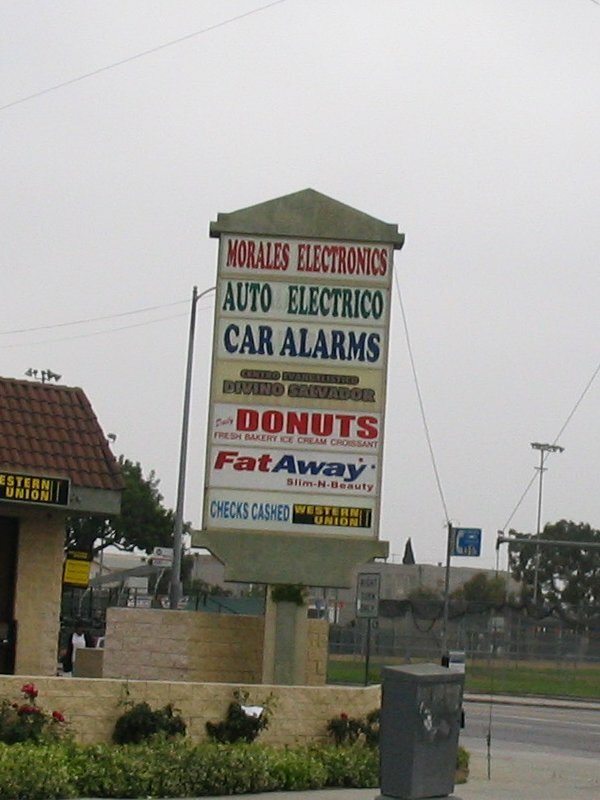 When we got near downtown, I saw the mini-mall with “Donuts” and “Fat Away” right next to each other. That was a funny one. Then we turned left on Hoover and headed north. On one of the side streets, we saw an abandoned couch. When I went to get a close look at it, I noticed another couch up the block. When we got to Wilshire, I realized we’d missed a turn. We were supposed to turn off on Benton Way, but it turned out to have a different name that far south. So we went up the street that was to become Benton Way, and in a few blocks, it did. That was where I saw the third couch. Benton Way is a good street for riding because it is nice and quiet, but it still has a bridge to cross the Hollywood Freeway. Then it goes up a short but steep hill and we come out on Silver Lake Blvd at the top of the hill. From there, we rode down to Glendale Blvd and over to Fletcher to get back to Eagle Rock. At the north end of Eagle Rock, we took Yosemite across and then up the Colorado Hill. Then straight home on Orange Grove. Just before we got back to the park, the sun finally came out. It was a nice ride. 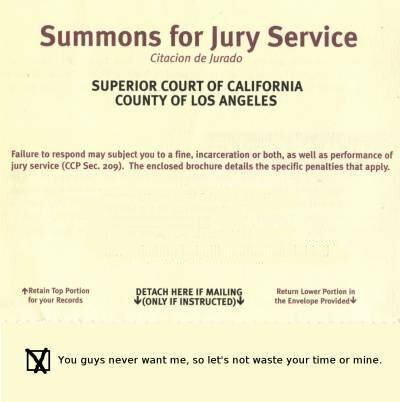 So, I’ve just spent the last two days on jury duty. At least this time I didn’t have to drive my car downtown. I rode my bike to the station and took the train, which is a pleasant ride. 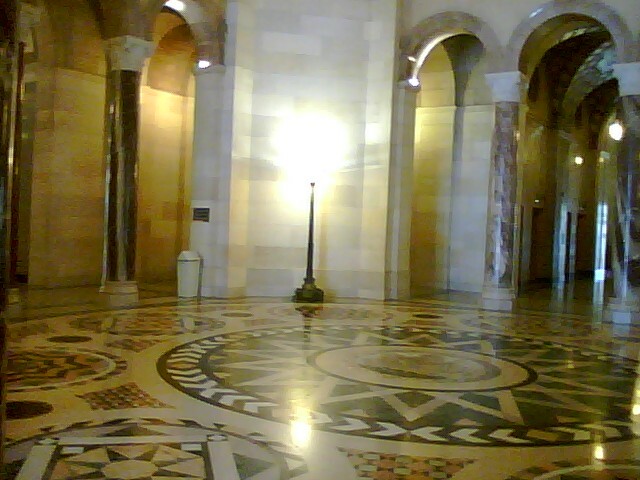 And at lunchtime I went and saw Los Angeles City Hall. I’d been on a tour there back in ‘99 when they were doing the earthquake retrofit on it, so I was curious to see how it turned out. It looked much nicer with the scaffolding gone and the walls rebuilt. 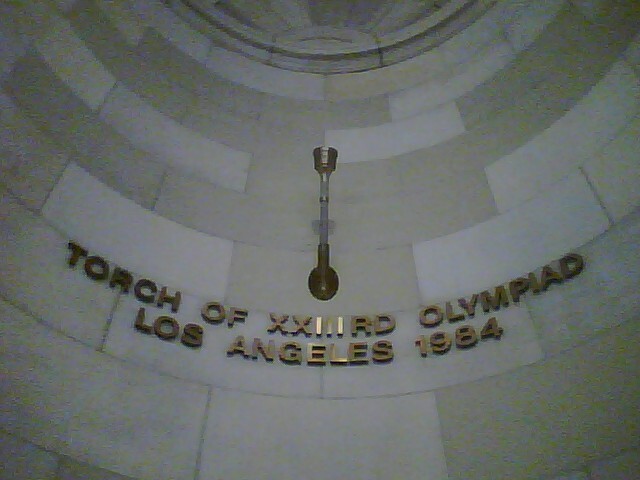 Sadly, since they don’t allow cameras in the courthouse, all I have is crappy phone-camera pictures. 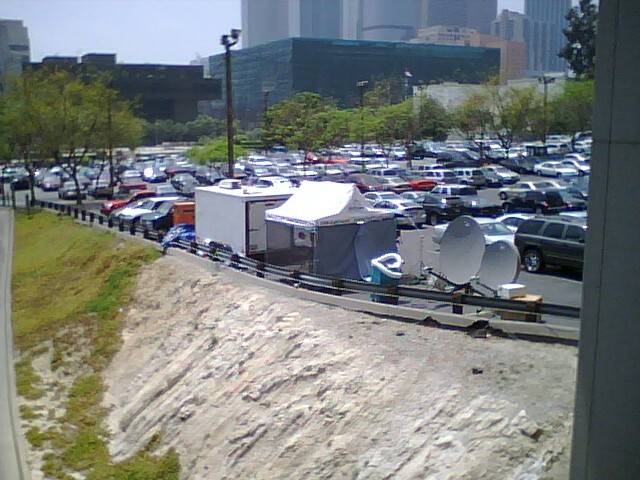 There were also a lot of TV crews hanging around there for the Phil Spector trial, or ‘The Spectorcle’ as I heard some people in the elevator refer to it. This was going on down the hall from the courtroom I ended up in, so we all had to go through a double-layer of metal detectors and X-ray machines. And they insisted that I leave my bicycle pump at the guard desk downstairs. They thought it could somehow be used as a weapon. I whacked a dog on the snout with it once. And the courtroom I was put in was Room 101. Of course, the first thing I thought of was George Orwell’s Nineteen Eighty-Four. Room 101 was where the Thought Police took you when torture didn’t work and they wanted to break you by making you meet your deepest fear. Seemed appropriate. Then they throw me out. I’m kind of getting a complex about it. I’ve asked a lot of lawyers about this. Nobody seems to have a good idea why this is so. For some reason, they just don’t like me. On the other hand, I’m not exactly excited by the prospect of sitting on a jury, but still, it’s weird that they reject me so consistently. They never ask me any questions about my attitudes about things or anything. I even saw one of the attorneys make a mark on the post-it for my seat right after I sat down. Even before the Five Questions. So it seemed clear that something about my appearance put him off. Back when I took the ‘How to Perform Stand-Up Comedy’ class at UCLA, the consensus in the class was that I looked like the kind of guy who pays his bills on time. What the hell?